tanding out is an advantage. Every manufacturer, businessman and salesman knows that. Audio manufacturers realize that too. Even though many audiophiles claim to be very open-minded when it comes to new ideas and solutions in fact they are hard-headed traditionalists. Why, do you think, since 1960ties most audio devices feature flat, cuboid enclosure with elegant front and connectors placed on the rear? Most devices sport chassis with a wide, low profile front, with its width being usually a bigger dimension than its depth. Sure there are some exception, but their numbers are irrelevant. Audio devices are not particularly colorful either – most are black or silver; only recently white became popular. 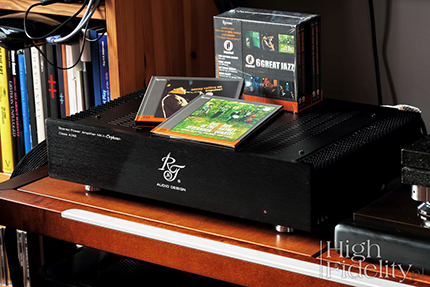 It is easier to attract audiophiles' attention with some technology, or solution. Assuming that they even know about it :) For example, class A – many audiophiles dream about it, considering it to be a solution to all problems. Even more self-aware audiophiles like something to be added on top of that, like stabilized power supply. Yeah! That's really something. Today among biggest manufacturers probably only Naim uses those. In Poland Kunstagon used them in their products years ago. But these are rare gems. RT Audio Design, a small Bulgarian company, was founded by Tsvetan Tsencov, the chief designer, and Ivaelo Ratzov, who takes care of the aesthetic form of their products. 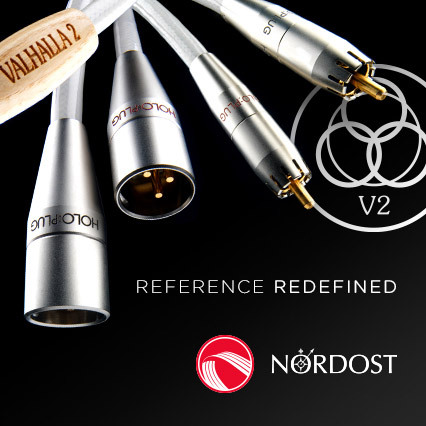 This company adopted all above mentioned 'audiophile's dreams' and implemented them in their products. As our review of D/A Converter Ultra USB DAC Orpheus proved, their designing ideas are interesting and their products sport nice, but not showy enclosures. 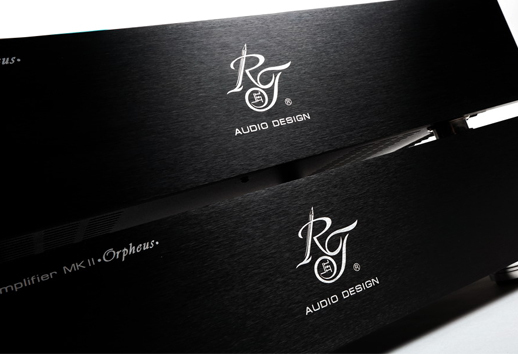 The Orpheus line, apart from said DAC, includes also power amplifiers. The latest addition is the „power amplifier push-pull class A MkII Orpheus”. It's so new that I had to wait a month or two before first batch was available for testing (the unit under review features serial number: 00002). Even though it is just a power amplifier, so its functionality description should take just a few sentences, this one seems quite unique in this respect. Yes, I am also surprised – that's a stereo power amplifier so just an input, an output, power inlet and that's it, right? Some more advanced units feature both, RCA and XLR inputs and some also a LED indicator on the front. Orpheus is something more. First of all it is a class A amplifier, working in push-pull configuration. It means that it produces a lot of heat and delivers a limited power. Manufacturer declares that it is able to deliver 50 W at 4 Ω, which means probably that at 8 Ω it outputs no more than 20, maybe 25 W. Which is not much – many tube amplifiers offer bigger output. But class A solid-state amplifier's distortion and noise level is lower, and so is the output impedance especially if more than one pair of transistors works in the output stage (in this particular case there are two pairs). Low output impedance means high damping factor which translates into better loudspeakers' control. Orpheus does not use a standard, non-stabilized power supply, but a stabilized one, that utilizes power transistors as active element. Such type of power supply guaranties lower level of distortion. But on the other hand it gives amplifier almost no power headroom. 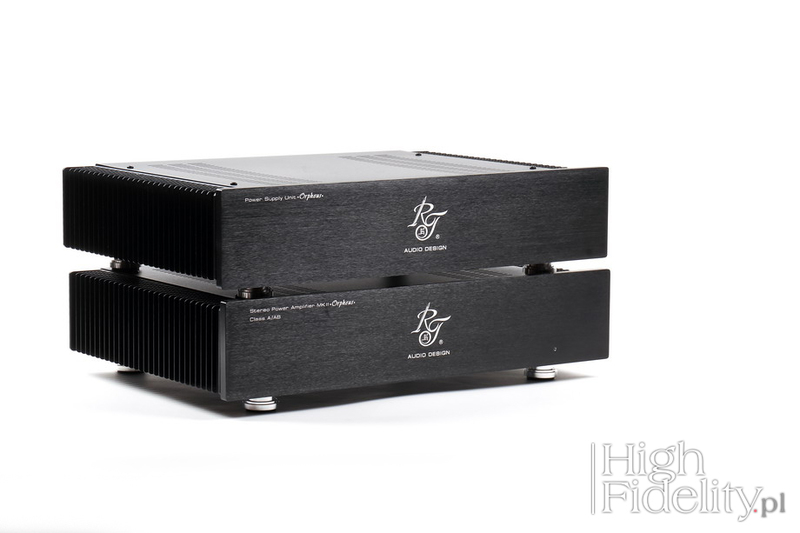 Power supply utilizes a separate enclosure – so what we have is a two-box design, a very rare case among stereo power amplifiers. And that's not all. Front panel reads: „Class A/AB”. One can order this amplifier in one of two versions: operating in class A or in AB. The latter delivers output of 250W into 4 Ω. A different power supply is delivered with this version. But also an owner of class A version can turn his unit into one working in class AB. One has to remove the cover, adjust bias and replace a fuse. Upon request manufacturer delivers a detailed description how to do that. Using the same power supply (as for class A amp) amp will deliver 80 W @ 8 Ω. Our new power amplifier Orpheus works in class A and it is a genuine reflection of our sound philosophy. We decided for an outboard fully shunt regulated power supply. Rectifier is based on fast SIC Shottky diodes supported with a large filtering capacity. The regulator features transistors as active element. Power stage delivers more than 30 A DC. There are no capacitors in signal's path in the amplifier section which allowed us to minimized phase and frequency distortion. It improved bass control and timing too, We used professional grade drivers driving audiophile grade output transistors. The output section works in class A delivering 50W into 4 Ω loading with output impedance of 0,1 Ω. The amplifier utilizes silver internal cabling, power supply utilizes OCC copper one. All passive components are low tolerance, and we utilize no SMD. The design of the amplifier is minimalist and signal's path very short. We also used professional power connectors instead of classic IEC ones. TEST: RT Audio Design ULTRA USB DAC ORPHEUS – D/A Converter. I would compare coming across such an amplifier as this one to finding a gold mine. No, it doesn't offer anything I haven't heard before. Every now and then I come across such special, unique amplifier – like Polish SinusAudio or British Tellurium Q (Iridium 20) to name a few – but not often enough. They are a gold mine because they treat music in a particularly unique way, interpreting it in their own way, signing it with their own 'sonic signature'. If you like this approach you might spend hours and hours listening to all of your favorite albums and then go to the shop to buy even more music to find out what will be this amp's interpretation it. That's how this unique type of amplifier works on me. Orpheus presents a warm, rich sound. If you're looking for a class A, warm sounding transistor that does not sound like a typical solid-state machine at all, that turns digital sources into analogue-sounding ones, you should give this amp a try. Sure, there is a bit of exaggeration in my description – it's not THAT analogue - it's as much of a stereotype, as 'warm sounding class A'. But if one was ever to benefit from stereotype it would be in this particular case. This amplifier only confirmed what I figured out when reviewing RT Audio Design DAC some time ago, about its designer's own musical preferences. I'm pretty sure that he loves: vocals, old jazz, chamber music as these genres sounded remarkably. 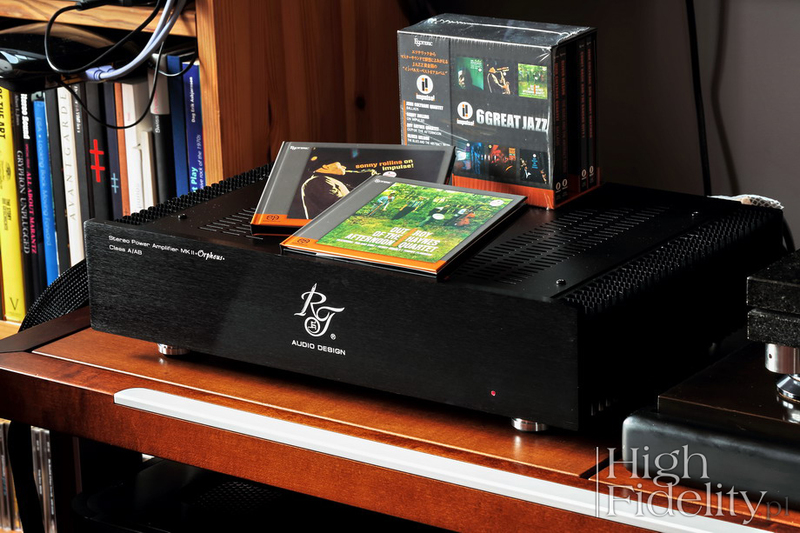 Within certain limits, I mean – this amplifier offers presentation that in some areas is ostentatiously far from being neutral. I also loved the way it played classic rock and many albums with electronic music too, including latest one from Jean-Michel Jarre Electronica. Vol. 1: The Time Machine. This album seems to be sort of recap of the whole carrier for the artist, as if he thought it was coming to an end and wanted to look back at what he achieved and work with artists he liked and admired. In the particular case of the track recorded with Tangerine Dream it turned out to be the very last moment to do that.